All of the raptors working with Michigan Avian Experience are unable to survive in the wild due to poorly healed injuries. As avian predators, their wings, feet, and eyes need to be perfect in order to survive. Even then, in some cases it is estimated only 20 % live into adulthood. This sprightly falcon is the smallest of its kind in North America. Taken from the nest illegally as a hatchling, he is too used to people to be released. Although only weighing quarter of a pound, he has the charisma of a much larger bird. 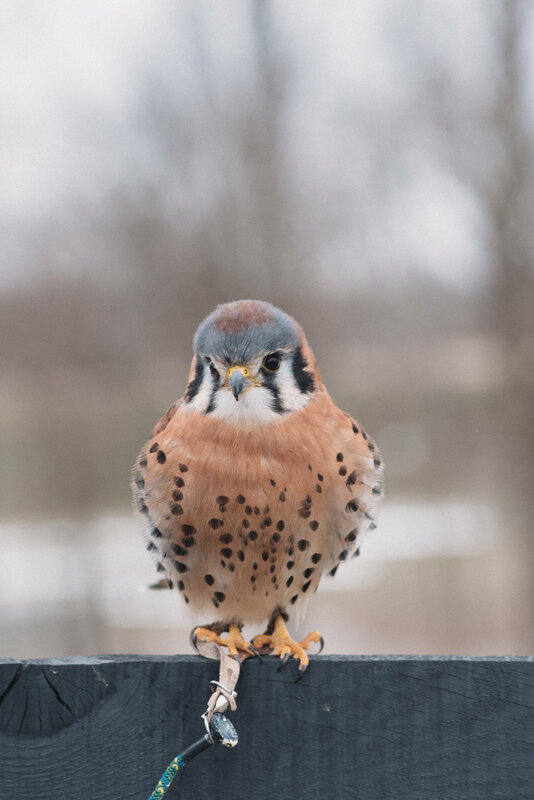 This little falcon is the smallest of its kind in North America. She too was taken from the nest and is a human imprint and unable survive on her own in the wild. Our newest addition to the team shows great potential as a budding educator. No matter where she is, our eagle has a commanding presence. A wing and leg injury along with being imprinted on humans deem her non-releasable. Whether she is teaching a school group or flying during a program this a bird you won’t soon forget! No stranger to the job, this owl is a veteran on our education team. When she was pulled from the nest by a crow, she broke the bones of her facial disk. This injury healed but causes her beak to grow in crooked. Affectionately called our “dinner bell,” she calls out to remind us when it is dinner time. This small, compact raptor spends most of its time nesting and hunting in the forest. Broad-winged hawks are renowned for their impressive mass migration each fall. Small in stature this bird has a big personality. She regularly enjoys a bath in her water bowl – sending water flying! Suspected to have been in a collision accident her vision and flight is impaired. Currently our oldest resident, the golden eagle’s hatch year is believed to be 1990. Her primaries, or flight feathers, grow in abnormally shaped. She is not able to sustain flight. Curious and playful begins to describe our largest nocturnal resident. As a little owlet, her nest was destroyed leaving her to be raised by people. This animated educator is well on her way to becoming seasoned veteran. Our steady tenured educator has been on the job since 2004. A right wing injury keeps him in an education setting. However, we are able to fly him for programs. He is dependable and an absolute pleasure to teach with! It takes a village to care for our team. Your financial donation helps!